In my day job I have to produce documentation, as well as review documents produced by others, and it never ceases to amaze me how much extraneous verbiage people pad their work out with. I’ve always attempted to keep my documents succinct and relevant to the task at hand, so I was delighted when I came across this document in eBay. Now that I’ve dropped it onto the scanner and OCRed it, it’s now posted here for others to enjoy. 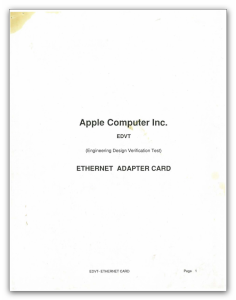 I don’t have any details to the actual Ethernet card the design verification is referring to, or any dates for when the document was issued. If you have any information or thoughts, feel free to add them to the comments. 2.1 This test plan outlines the methods to be used to meet the above objectives. required. It does not include such items as oscilloscopes, meters …. etc. 1 ) 5 COMPUTERS Configured to exercise the ETHERNET CARD.